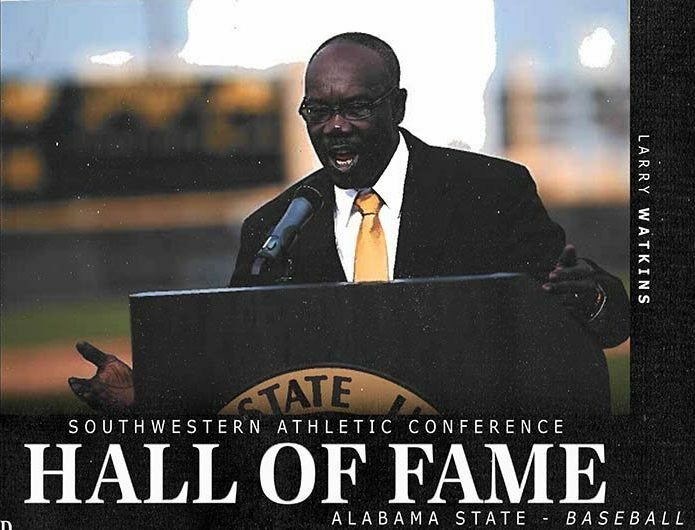 Former Alabama State baseball coach Larry Watkins officially became the 18th member of the Southwestern Athletic Conference (SWAC) Hall of Fame from Alabama State in an induction ceremony at the Birmingham Sheraton. And moments after receiving his red coat and Hall of Fame ring, Watkins took the crowd back to his roots growing up in Thomasville (Ala.) and where he got his start. “I have to take you back a little while,” Watkins said. “I didn’t start at Alabama State University; I came from a little small town called Thomasville. But if you go to Thomasville, it is totally different. Thomasville taught me how to be humble. But I was taught by one of the best coming up. I lost my mom when I was in the fifth and my father was in and out of my life. The only person I had to lean on was my grandmother, and grandmamma put God in my life. And between the two of them, they carried me until I got in the ninth grade. Little did Watkins know, but the day he met Lewis would change his live forever and set him on the path to the SWAC Hall of Fame, and into coaching for 30-plus years. That was the day things changed for Watkins. The former student-athlete was graduating with his undergraduate degree, but Wheeler – who shares the name of the baseball stadium with Watkins – had other plans for the Thomasville-native. “What a relationship we had,” Watkins said of Wheeler. “He molded me, he molded me to become the next head coach at Alabama State University. And I cannot thank coach enough. I can recall on my graduation; coach Wheeler came up to me. I didn’t have any money and I was looking forward to go to work after I finished school. He gave me an envelope, and here I was knowing that I had some money. But when I opened up the envelope, God works in so many different ways. That envelope read ‘Congratulations Larry Watkins, you have been admitted to graduate school at Alabama State University.’ I didn’t know what to say, I thought it was money. Although Watkins was the man being inducted into the Hall of Fame, he had a special message for coach Wheeler. “Coach Wheeler,” Watkins said. “I know you are sitting up there now looking down at me, smiling. And I can tell you what you are saying. ‘Job well done son.’ Coach I thank you, and tonight this your honor. This honor tonight is the highlight of my baseball career. Although he may have been done with his stories, the now Hall of Fame Hornet coach wasn’t done as most of the room was filled with his former players, coaches and administrators from Alabama State; as well as his family. “I want to thank Alabama State for what they have done for me over the years,” Watkins said. “I would also like to thank my former baseball players, my support staff and administrators. If wasn’t for them, I wouldn’t be standing here tonight. 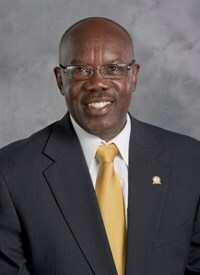 Watkins becomes the 18th member of the SWAC Hall of Fame from Alabama State. He joins the likes of C.J. Dunn (1992), Severne Frazier (1992), John H. Jones (1993), G.H. Lockhart (1993), John Garrick Hardy (1994), Charles (Buddy) Spears (1994), Frank Lewis (1995), Jesse White (1995), Norman W. Walton II (1996), William B. Gary (1997), Eddie Robinson, Jr. (1998), Lewis Jackson (1999), James Oliver (2002), Horace Crump (2009), Reggie Barlow (2013), Steve Rogers (2015) and last year’s inductee Shameka Jackson (2017). He joined Alcorn State’s Dave Washington, Jr., Grambling State’s Ralph A. Garr, Sr., Jackson State’s Eric Strothers, Prairie View A&M’s Nathaniel Gross, Southern’s Roger Cador, and longtime league administrator Lonza Hardy in this year’s class. Currently, he serves as a Special Assistant to the Athletic Director at his alma mater, and the Hornets’ home field carries his namesake alongside former Alabama State coach Herbert Wheeler.